Two white flashes of 0.2 seconds, separated by intervals of 2.3 then 7.3 seconds of darkness. The officer of the watch on the bridge of a ship from anywhere in the world will recognise this as the approach signal of the Creac’h lighthouse on Ushant. After passing it ships are rapidly channelled into “the armhole of the sleeve,” to use metaphor dating back to the 17th century. They leave behind the long swell of the Atlantic to enter the choppy sea but, unlike the craft of the past 2000 years, today’s super-sized powerfully engined ships no longer fear these short, hard waves. 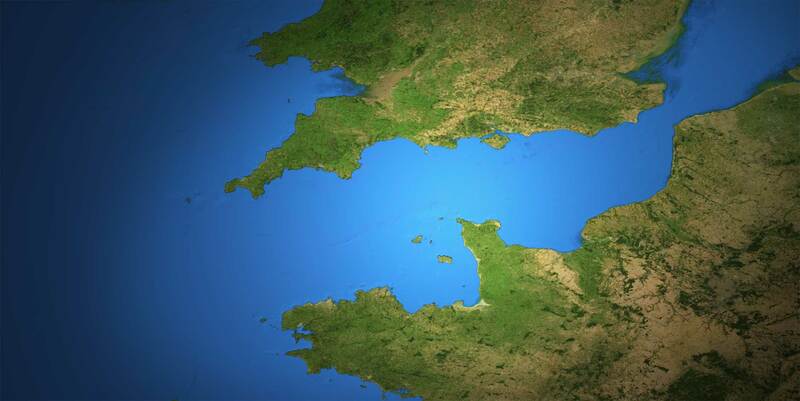 The western approaches into the Channel, stretching between the Scillies (marking the westernmost point of Cornwall) and Ushant (the northwesternmost point of Brittany) are wide, but fraught with potential danger. The five lighthouses encircling the French island outpost and the three surrounding their English counterparts are on constant alert. The sea passage narrows to some 100 km between the Cotentin Peninsula and the Isle of Wight, before narrowing again, and reducing in depth to between 30 and 60 metres, it reaches the Straits of Dover where a mere 30 km, riddled with shallows, separates the white cliffs of Dover from the almost identical chalk faces across the water at Calais. The world comes to Europe by way of this sea, a ship of over 300 tons enters and leaves the Channel every ten minutes. From the Americas, from Africa and above all from Asia, ships arrive and depart, laden with cargoes of all kinds. The Channel is today the world’s busiest maritime thoroughfare, ahead even of the Straits of Malacca that separate Singapore and Malaysia from Indonesia. One quarter of the world’s trade passes through it.